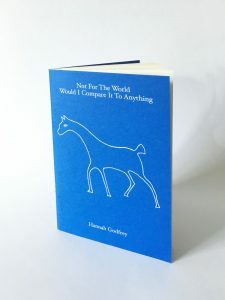 The series of stories and essays in Not For The World Would I Compare It To Anything describe experiences of being alone, being present, and transience, and how this in turn effects fundamental needs, such as the ability to feel at home, to rest, and know oneself. Read a review of it here. Written with the generous support of the Winnipeg Arts Council. Published by Parameter Press, Winnipeg; 2018. Buy the second imprint, printed digitally, for $7 + postage. Email me to get the ball rolling.